Visiting castles in Italy and the medieval towns around them can be a rewarding part of Italy travel. Castles are evocative of Italy’s past and have fantastic views of the town and surrounding countryside. Some Italian castles have museums inside and some have even been remodeled into hotels where you can spend the night. Here’s a sampling of Italian castles. Click on the photo to see it larger and click on the link above the photo for more information about the town and castle. Want to stay in a castle? Check these Castle Hotels in Italy. 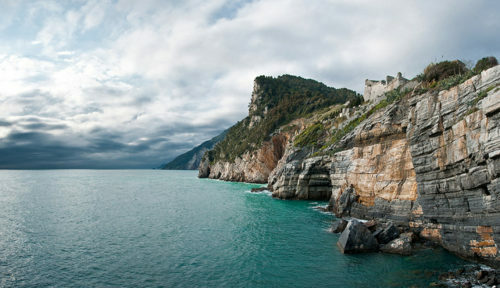 Portovenere’s Andria Doria Castle dominates the pretty Italian Riviera village of Portovenere. Built by the Genoese between the 12th and 17th centuries, the castle now houses a small art museum open in the summer from 11:00. Narrow medieval streets lead up to the castle where there are fine views of the sea and the picturesque San Pietro Church on the edge of the promontory. La Rocca Albornoziana sits above the hill town of Spoleto in the southern Umbria region. From the castle there are great views of Spoleto, the Bridge of Towers over the gorge, and the surrounding valley. Rocca Albornoziana was built on the foundation of the Roman acropolis in the 14th century and served as the seat for local pontifical governors. It has two grand courtyards, six towers, and some beautiful frescoes. Visiting the castle is only possible on a tour, arranged at the ticket office at the entrance to the castle grounds. Check the schedule for the English tour times. Castell’Arquato is a picturesque hill town in the Emilia Romagna region of northern Italy topped by its castle – Rocca Viscontea di Castell’Arquato. Inside the castle is a fortress museum with a video about the castle and four rooms about life in the middle ages. You can climb the stairs in the tower for fantastic views of the town spilling down the hill and the surrounding countryside. Although its small, this is one of my favorites and its not overrun with tourists. The town has been the setting for several movies. Pontremoli is a well-preserved medieval town and principal town of northern Tuscany’s Lunigiana region. Above the town is a restored castle, Castello del Piagnaro, with the Museum of Statue-Menhirs, a museum of prehistoric stele statues or sandstone sculptures that are important prehistoric artifacts. Piagnaro Castle gets its name from the slate slabs, piagne, common in the area. From the castle, there’s a great view of the town and the surrounding hills. The museum and castle are open daily except in winter when it’s closed on Mondays. This entry was posted on Sunday, October 21st, 2012 at 10:02 pm	and is filed under Discover Italy. You can follow any responses to this entry through the RSS 2.0 feed. You can leave a response, or trackback from your own site.